A popular photo service for bloggers and webmasters-alike ceased image-sharing operations earlier this month and it has created a huge blow to how royalty free images are found and used online. The service even has the ability for webmasters to make money with their revenue sharing program, but now it’ll be harder to earn anything. Picapp changed last year when it required users to sign up for an account to be able to embed photos. Previously, you could just go to their website without registering and embed away. Shortly after they introduced the members section, they looked at their business model again and decided it wasn’t worth their time anymore to continue to offer bloggers free access to the photos they make available through their relationships with news and photo agencies. In late December, they sent out an e-mail stating the service would shut down on January 1, 2011. It was more like January 3 when they removed the search function to scan their site for new images. They soon rolled out a widget though, which enables you to embed a group of photos in a gallery, albeit thumbnails that link to larger versions of the same photos. Many have complained since the service stopped offering free photos and the company appears to be listening. A few weeks ago they sent out a survey asking if users would be willing to pay a monthly free to gain access again to news and stock photos for their sites. Of course I said I would gladly pay — how much is another story. Personally, I’d be comfortable with shelling out between $10 and $20 a month to use a few images to help jazz up posts. Hopefully they listen to their audience and come back with a better and improved service to continue offering great content. Dealing with a photo agency yourself could cost you hundreds for the rights to publish a couple photos. Picapp acted as the middle man and dealt with that for you, creating an opportunity for photos to be freely shared and accessible to bloggers. With the New Year comes many goals and plans for blog owners that they may have put off the past year. Besides running their business, generating an income, development contacts and ensuring they’re on track, backend maintenance to an entrepreneur’s website is just as important. While you could easily hire someone to do it for you, it’s best to make sure you know what’s going on yourself. You’ll notice I haven’t posted in a few months, which is not like me, but I took the latter part of 2010 off to focus on a new company I was working to get off the ground. Now that it’s pretty much running smoothly, I thought I’d get back into blogging and started by ensuring this site was running at top speed (as much as possible, that is). The great thing about WordPress is the many tweaks you can make have an instant improvement on your site’s performance. I put together a few tips that helped me speed things up and get me ranked higher in Google, now that they consider a site’s speed when deciding where you fit amongst the search results. Delete unnecessary and unused plugins — Plugins take up storage space on your server and bog down your website. Use as few as possible and delete the ones that you’ve deactivated. Minimize widget use — Many blogs use widgets for a number of things, such as their Twitter feed, RSS subscriber numbers and other fun add-ons. If you must use them, use only one or two. When your blog loads, the server waits for all of these extras to respond and it slows down the load time of your site overall. Compress your images — Whenever you upload an image, make sure it’s as small as possible, while still not sacrificing quality. Use JPGs for photos, PNGs for transparent graphics and GIFs for logos and other small images that don’t require a lot of color. GIF will be the smallest format, followed by JPG and then PNG. Avoid the BMP format at all costs. If server space is an issue, consider a free service like Flickr to host your images. Use a cache plugin — Caching your site’s content makes it load faster for returning visitors and saves on server resources because files that don’t change often, such as your CSS file and design images, are stored on a user’s computer for when they return. I highly recommend W3 Total Cache plugin for WordPress. It’s very easy to configure and work’s great. Use a CDN — If you really want to take speed seriously and have some money to spend, a Content Delivery Network (CDN) may be for you. Basically it’s a third party service besides your web host that hosts data and pulls it from the server closest to where your visitors are located. I personally use MaxCDN, which offers 1000 GB (1 TB) for $39.95. I’ve always been pleased with them and they have great customer service. In the end, the web standard has become to have a fast website to deliver your customers exactly what they’re looking for in the quickest amount of time possible. 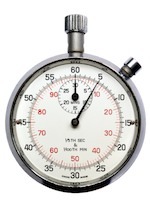 If they have to wait several seconds for your content to load, they will easily click off and visit your competition. A free tool to test your site’s current speed is iWebTool.com. Anything under 2 seconds is acceptable. It seems like just a few weeks ago WordPress came out with a new version — that’s because it was. It’s been just 43 days since WordPress 3.0 was released, and already the developer has come out with an upgrade. Late Thursday night, WordPress 3.0.1 starting appearing in bloggers’ dashboards. WordPress says it’s a small miscellaneous bug fix, but hopefully they fixed the issue when upgrading plugins. Many bloggers have been complaining for over a month that the new automated upgrade feature for plugins is a bit buggy. The issue appears to cause the entire WordPress installation to stall as the little progress wheel spins. Eventually you have to manually go in and upgrade the plugins you want, as the automated feature just can’t handle it. The new version seems to remedy that issue. It’s also a very solid release, and you shouldn’t worry about breaking your installation. Upgrading was painless and easy. Bloggers on the go now have yet another way to publish posts to their WordPress blog — via telephone. WordPress announced earlier today the ability to post audio to your blog up to six minutes at a time. So, while you can post from your desktop, e-mail, BlackBerry, iPhone, iPad and Android, there’s now another way for on-the-go bloggers to literally post from anywhere. WordPress founder Matt Mullenweg made the announcement on his blog, and even posted a sample audio clip to show how it’s done. The only downside to this is that it’s only available to bloggers using WordPress.com, and not WordPress.org. The new feature is available now for free to all bloggers using the WordPress.com platform.